Arielle started with Friedman Williams in 2016. She received her Bachelor’s degree from SUNY Cortland in 2015 and began her career as a Legal Assistant at an intellectual property law firm. 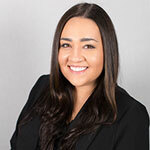 Arielle joined the legal world with intentions of becoming an attorney, yet realized she wanted to be in a position where she worked face-to-face with people every single day. Her diverse experience gives her a unique perspective on identifying talented Marketing, Business Development, Communications and Public Relations candidates for the legal and professional services industry. Outside of the office, Arielle enjoys reading and spending time outdoors.